'Havendance' (Ken Mohr by Bryce Williamson, R. 1994). Seedling# Q-61. TB, 36" (91 cm), Early midseason bloom. Standards light to medium lobelia blue tinted lavender; falls ruffled medium lobelia blue, deeper lavender violet wash intensifying to distinct center stripe; beards cream yellow, tipped white; slight fragrance. Seedling# J-172-1 X seedling# 69-1. Pacific Coast Hybridizers 1994. From AIS Bulletin #293 April 1994 Introducing HAVENDANCE (Ken Mohr). 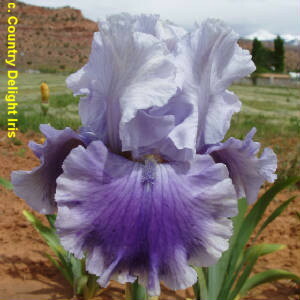 Medium chicory-blue standards are tinted in softest lavender; falls slightly darker with an infusion of dark chicory-blue at the hafts and down the center of the falls. With nice branching and bud count, we have been pleased with this different neglecta that will remind many of Lineup. $35.00. Pacific Coast Hybridizers. JPG HavendanceSI.JPG manage 241 K 16 Apr 2019 - 15:44 Main.TLaurin Photo by Sandy Ives.